With the growing tourism industry and the constant demand for something different and new for the tourist,the Heritage Hotel concept came on the scene. The tourist who looked for something other than the usual star category hotel,was delighted with the haveli. Within a couple of years, not only the number of Heritage Hotels has risen substantially but also these are booked well in advance invariably. In a class by themselves, these heritage hotels extend their own unique services to the tourist. Dressed almost always in traditional turbans and dhotis,the old family retainers cater to the same kind of care and hospitality to the tourists as they do to their personal guests.In most of these havelies,the host himself is always around to ensure that the guest is comfortable and well looked after. What these palaces lack by way of five-star facilities they more than make up by the personalized service that they extend. The Department of Tourism takes active interest in promoting these heritage hotels. Some are listed below. A more detailed list is available with the Department of Tourism,Government of Rajasthan. A palatial residence built in the 19th century. Large rooms with furniture dating back to he east India company days it is very popular with tourists and has been a hotel for several years. A huge haveli with some exotic murals and period furniture. It is located in the city. Converted into a hotel recently, this is a fairly new haveli located just outside the walled city. Managed by one of the leading hoteliers of India,the lodge is located 30 km from Jaipur and overlooks the Ramgarh lake. An interesting place for a quiet weekend. A grand palace built in 1729,it has sprawling lawns,a swimming pool and a peaceful air about it. Ideal for relaxing on the lawns and watching peacocks. Built originally as a hunting lodge by the Maharaja of Alwar in the late 19th century,this is a majestic palace located just outside the Sariska National Park. Run by the RTDC (Rajasthan Tourism Development Corporation),there are very few palaces in Rajasthan which can match the charm of this tiny palace. Nestling in a lush green valley overlooking a serene lake,Siliserh is an unbelievable little resort. Close to Delhi,this 17th century for has been recently resorted and offers the tourist a delightful glimpse into history. Almost every little village in Shekhwati is rich in painted havelis. 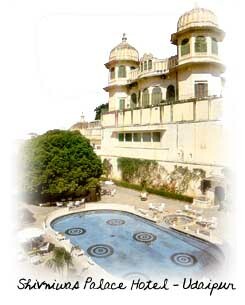 The ones that are taking in tourists include SAMOD PALACE,CASTLE MANDAWA,NAWALGARH, DERA DUNDLOD and ROOP NIWAS PALACE. These are all located in villages and provide an insight into the rustic way of life. Royal Castle Khimsar: Built by the founder of Jodhpur, Rao Jodha, in the 15th century,this is now run by a professional hotel group. Special tours are arranged to familiarise the guests with the village. Rohet Garh: Well maintained and located in arid surroundings, Rohet Garh still contains some old Persian carpets and chandeliers in good condition. Ajit Bhawan: A palatial mansion and a very interesting village complex, in Jodhpur. This has been extremely popular with the tourists for several years now. Shiv Niwas Palace: Run by the erstwhile ruler of Udaipur and providing all the five-star facilities,this is one of the grandest and most exotic palaces in Udaipur. Udaivilas Palace,Dungarpur: A fairly recent entrant to the heritage hotel chain ,this is an impressive palace overlooking a lake. Some other interesting hotels in this chain are Swai Madhopur Lodge and Jhoomar Baodi in Sawai Madhopur,Bhanwar Vilas in Karauli,Golbagh Palace in Bharatpur,Lalgarh Palace in Bikaner,Brijraj Bhawan and Umaid Bhawan Palace in Kota and Govindgarh for near Pushkar.